Tradition Senior Living, LP, a high-end senior living owner, developer and operator, has broken ground at The Tradition-Woodway, 6336 Woodway Drive, Houston, Texas 77057. With an exceptional location in the heart of Houston’s premier Tanglewood and Memorial areas and next to Second Baptist Church, Tradition Senior Living’s second community in Houston will be home to 314 residences. The initial opening is planned for April 2020. 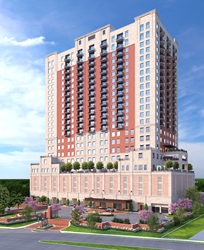 A 23-story, high-rise rental community with no buy-in fee, The Tradition-Woodway will offer a continuum of care, including 222 Independent Living residences and 92 Assisted Living/Memory Care residences. This will be the fourth campus developed by the Texas-based senior living company, which was founded by Jonathan Perlman, Sr. The Tradition-Woodway will boast resort-style living with ultra-inclusive services and amenities: 24-hour concierge; valet parking; beautiful, light-filled residences and common areas, including lounges and card rooms; a movie theater and an indoor golf simulator; a secure parking garage with controlled access; some of the area’s largest one- and two-bedroom apartment homes; a penthouse floor with larger apartments; restaurant-style dining in multiple venues with extensive menus; exceptional daily activities and wellness programs; lush landscaping, a dog park and a putting green; and transportation. Comprehensive fitness areas will include an indoor pool, a weight room, a Pilates room, and a group-exercise room for classes taught by in-house fitness instructors. A Physical Therapy Center will have an underwater treadmill. The safety and well-being of the residents are always top-of-mind at The Tradition, and state-of-the-art security measures, including access control and security cameras, will be established throughout the community. The Tradition-Woodway will have natural gas generators that will provide an electrical backup system for the entire community. The Tradition-Woodway’s spacious common areas will retain the classic, elegant themes previously established by Tradition Senior Living – beautiful, English antiques in airy, livable rooms. The upscale high-rise will provide extraordinary views of the city. Perlman noted that The Tradition-Woodway is situated directly across Ripple Creek to the east of Second Baptist Church and less than a half-mile west of the entry to Houston Country Club. The location provides convenient access to excellent shopping, restaurants, churches, and some of the finest medical facilities in Texas. Jackson & Ryan Architects and D.E. Harvey Builders, both based in Houston, serve as the architect and general contractor. Tradition Senior Living, LP will manage The Tradition-Woodway. An information center for this second Tradition community in Houston is set to open the last quarter of 2018 onsite at 6336 Woodway Drive. The Tradition-Woodway, call 713-423-6066 or see Tradition Senior Living's website. Founder and CEO Jonathan Perlman, Sr., has worked in the senior living industry for the past 21 years and has experience in all phases of the business. Prior to founding Tradition Senior Living, LP, Perlman was involved in the development, finance, construction, marketing and management of nine senior housing projects totaling more than 1,800 units. Tradition Senior Living’s Dallas communities comprise a total of 639 units across two campuses. The first community, The Tradition-Prestonwood, opened in 2010; the second, The Tradition-Lovers Lane, opened in 2014. The third (and the first in Houston) is The Tradition-Buffalo Speedway, which is set to open December 2018 and will be home to 316 residences.